Some Galaxy smartphones will be dropping on April 10, as confirmed by the Korean tech giant a few days back. While the phone maker hasn’t specified the devices that will be launching, rumor spinners suggest we will witness the launch of a couple of Galaxy A series of smartphones, but with the Galaxy A20 and A40 out of the way, the only probable phones worth giving a special treat are the Galaxy A90 and A70. Both devices have been rumored for some time now, but the A90 appears to be the most interesting of the duo. The biggest and most interesting speculation about the Galaxy A90 is that it will drop the company’s infinity U or V display for the Oppo Find X type pop-out camera module. We first got to know of that a few weeks ago, after which the company’s US site revealed the device would get capable hardware, and now, it appears it has again confirmed what could be the biggest selling point of the upcoming. 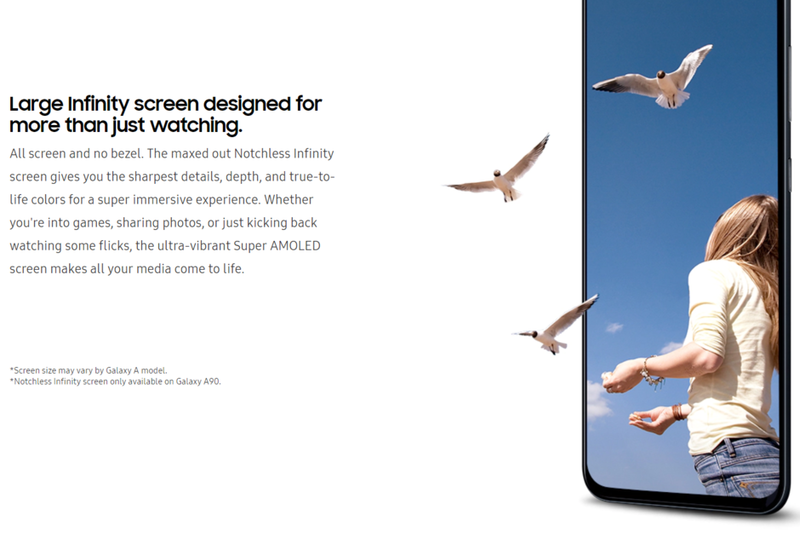 A section of Samsungs Indonesian website(deleted already) made reference to a ‘bezel-free and notchless Infinity screen’ for the A90. To ensure/achieve this, reports say the device will get a pop-out camera with a rotating mechanism which implies the device will utilize the pop-up camera for both selfies and normal shots. Aside from the pop-up camera system, the device might get an in-display fingerprint scanner, while a tip from Samsung earlier this month suggests it could get a powerful SoC, perhaps the SD 855 coupled with 128GB of storage and up to 8GB RAM, while a battery marked with the model code EB-BA905ABN and will be a 3,610 mAh capacity. While that isn’t bad for a budget phone, it falls short of the A50 with a large 4,000 mAh battery and the A70 that is tipped to come with a much more larger a 4,400 mAh battery.